The Eagles are now a more balanced offensive team showing this in its win over Top 10 ranked DII Central Washington in rushing for 328 yards. Yet still has a great passing game with senior Gage Gubrud under center. This week, EWU travels to a familiar opponent in Northern Arizona even though this game is considered a a non-conference game. While this won’t count in the Big Sky Conference standings, it still will go a long way at the end of the season when playoff bids are announced. Key Player: QB Gage Gubrud has accounted for 9,786 yards of total offense and has 79 touchdown passes in career so far. Last week, he threw for 337 yards and five touchdowns with a near-perfect 19-of-23 performance. Fantasy Bonus Baby: RB Sam McPherson had a career-high 185 yards – the most by an Eagle in five years – and scored once. The senior should see some open holes in what very well could be a shutout kind of game this week. Northern Arizona jumped out to a 17-0 lead and never trailed as it posted its first victory over an FBS opponent since the 2012 season with a 30-10 win at UTEP. The Lumberjacks have come out victorious in 24 of the last 25 home openers with the lone loss coming last season by a 38-20 margin against Western Illinois. Saturday’s meeting will mark the second straight time the two teams have squared off at the Walkup Skydome, with the last coming on Sept. 24, 2016 which saw the Eagles post a 50-35 win. 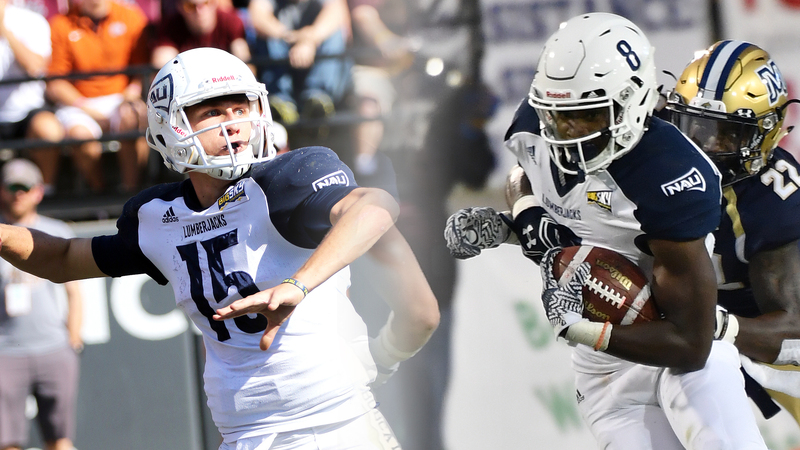 The match up marked the first between current standout quarterbacks NAU’s Case Cookus and EWU’s Gubrud. Cookus finished 17-of-28 with 245 yards and three touchdowns, while Gubrud put up 392 yards on 36-of-57 passing and a pair of TDs. Gubrud was also a factor on the ground as he totaled 95 yards on 11 carries. Key Player: QB Case Cookus has thrown for 7,914 passing yards and 74 TD passes in career. Last week, the junior had a modest game but was not really needed against possibly the worst FBS program in the country in UTEP. He finished the game 19-26 through the air for a total of 211 yards and two touchdowns. He will need better numbers to beat a more formidable foe in the Eagles this week. Fantasy Bonus Baby: WR Emmanuel Butler saw his first game action since Sept. 9, 2016 vs. Western Illinois last week and looked like he hadn’t missed a step as he rang up 138 receiving yards on six catches, including a pair of touchdowns, which allowed him to tie the program’s record in that category with 28 previously set by Clarence Moore (2000-03). Look for Butler and Cookus to hookup a lot in this game.